Do you remember my cranky post railing against people who add me to their e-newsletter lists as soon as we connect on LinkedIn? I send those people’s communications straight to spam. Why did this email work for me? The sender immediately reassured me that I was not being added to a frequent newsletter without my consent. Also, she enhanced her credibility by explaining why some recipients might see more of her than only her annual message. She sounded like a human being in her writing style, as shown by the third paragraph in the image. She offered some interesting information in the rest of the email. Is this a technique that you could adapt for your communications with your LinkedIn connections? Tell me how it works out if you try it. Do you feel disappointed when some of your e-newsletter subscribers fail to open your newsletters? It happens to everybody. The average “open” rate for financial e-newsletters is about 18%, according to Constant Contact. I’ve learned a technique that has boosted my open rates significantly in two tests. First, I increased the open rate on one of my monthly e-newsletters from 20.4% to 29.1%. Second, I increased the open rate on one of my Weekly Tips from 20.7% to 27.2%. Since then, I’ve achieved open rates greater than 30% on some newsletters. I achieved this improvement by re-sending those emails to people who hadn’t opened them within about a week following their original sending. 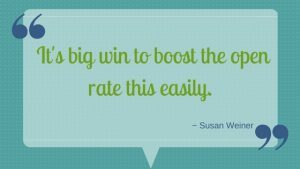 It’s big win to boost the open rate this easily. How did I do it? I had my virtual assistant use the QuickSend feature in Constant Contact. I imagine that other forms of e-newsletter software offer similar features. For example, Mailchimp has an option to resend an unopened campaign. I use QuickSend on every issue of my monthly newsletter. I use it on just one of my Weekly Tips because I don’t want to overwhelm my subscribers’ email in-boxes. I time the Weekly Tip re-send so it doesn’t overlap with the re-send of my monthly newsletter. Look at your newsletters. Think about how you can use this feature. If your newsletter is monthly, it’s a no-brainer to use this QuickSend approach. If you publish more frequently, be careful that you don’t overwhelm your readers’ in-boxes. Please tell me if it boosts your open rate and, more importantly, if it helps you to improve your relationships with clients and prospects. 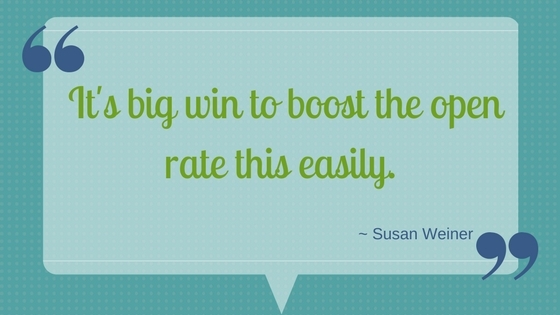 In addition to using QuickSend, I have another tip for boosting the open rate for your monthly newsletter. Don’t wait until your regular monthly date to send a newsletter to a new subscriber. I try to send weekly to new subscribers. I hope to attract more attention by contacting them while they still remember signing up for my newsletter. I reluctantly launched my career as a freelancer after getting laid off from a wonderful investment communications job at an investment management firm. After I decided to freelance, my phone didn’t ring with eager prospects. On the other hand, as an introvert, I didn’t do much to market myself. Cold calls? Heaven forbid. So, how was this a blessing in disguise? Because I developed a style of communicating that fits social media. I wish I could say I foresaw social media. It might be nice to be a guru. But, I simply acted like myself. When former colleague Tom Manning emailed me that he looked forward to my emails, I’d realized I’d stumbled onto something good. I turned my emails into a monthly e-newsletter, and I invited my networking contacts to subscribe. Those newsletter articles evolved into blog posts. Back then, I looked jealously at writers who immediately landed steady work with earlier employers or their vast pool of contacts. But, if I’d done that, I wouldn’t have developed my newsletter, which has become the foundation of my success. Send mass emails only to people who agree to receive them. Keep your name in front of prospects on a regular basis. You can’t sell them until they’re ready to buy. I think I’m lucky the world has swung my way. I’m also grateful for the wonderful readers who have supported my e-newsletter and blog. Nobody likes a pushy salesperson. Overly aggressive techniques can divert your email into spam folders. However, I believe it’s possible to market yourself without being too salesy. I’m writing this post in response to an FPA Experience attendee who asked this question anonymously. If you understand your prospects’ hopes, dreams, and fears, you’re off to a great start. Focus your email on your prospects’ desires rather than your products, services, or needs. Potential clients or customers are most receptive when they feel you understand them. To learn more, take the following step. Your mass emails count as spam under the CAN-SPAM Act. It’s not a question of being too salesy. Your communications are illegal if you don’t get permission to email the people on your list. You’re probably familiar with the offering of free reports to get people to agree to receive emails from you. It’s popular because it works, as long as the report provides useful content. Don’t plug your product or service at length at the beginning of your first contact. Instead, leave it to the end or weave it unobtrusively into the body of your report. On the other hand, don’t forget to promote your product or service in your freebie. That comes with the territory. I wonder if my anonymous questioner felt too “salesy” because she or he didn’t get much of a response to emails or even lost some subscribers after an email blast. Low response rates and subscriber attrition aren’t unusual, but they may have nothing to do with you. Your offering simply may not meet the prospects’ needs or your timing isn’t right. At least one person will find you too salesy. I guarantee it. When that happens, I remember what marketing expert Sandra Ahten told me, “Don’t worry if someone unsubscribes after you send a promotional email. That means they weren’t ever going to buy from you.” Sandra also said that interested prospects appreciate email reminders about your offerings. Despite my skepticism, I discovered she was right. You may not be the best judge of your email’s sales quotient. Running it by a friendly member of your target audience can give you a better sense of whether you hit the right tone. You can also experiment with splitting your email list into two groups and sending them different versions of your email. If one segment of a homogeneous group responds better to Email Version 2, you know that’s the winner. Learn from what works in Email Version 2. I don’t have the definitive answer to identifying what’s too salesy. Please share your opinions on this in the comments section below. When you address your correspondence to “Dear Valued Client,” you send the wrong message. It says you don’t care enough to personalize your message. So, check out the email solutions described in “Stop Sending ‘Dear Valued Client’ Emails” by Bill Winterberg on his FP Pad blog. He suggests using a service like Constant Contact, which I use to send my newsletter, or mail merge, like the function available in Microsoft Outlook. Allow plenty of time to get the hang of mail merge. It’s complicated. At least, that’s my experience. And, be sure to test your mail merge on non-clients before your first email to clients. I discovered some unexpected problems the first time I used Outlook’s mail merge function. Luckily, I’d used my husband as my mail-merge guinea pig. So none of the prospective clients for my writing and editing business had to suffer through my mistakes. March 13, 2017 update: The number of newsletter services has multiplied since Bill and I originally wrote about this topic in 2008. If I were starting my newsletter today, I’d look at MailChimp (free for up to 2,000 subscribers and 12,000 emails per month) and other competitors to Constant Contact. https://www.investmentwriting.com/newsite/wp-content/uploads/2016/12/investmentwriting_logo_2016.png 0 0 website admin https://www.investmentwriting.com/newsite/wp-content/uploads/2016/12/investmentwriting_logo_2016.png website admin2008-08-26 11:49:002017-03-15 11:48:41"Stop Sending 'Dear Valued Client' Emails"